Wing span: 7/8 - 1 1/8 inches (2.2 - 2.8 cm). Identification: Upperside of male grayish brown with a tan patch on hindwing inner margin; female light brown to tan with dark borders. Underside coppery brown to purplish brown; inner half of hindwing darker than light outer half. Life history: In California, males perch on shrubs or at tops of cliffs to watch for females; in Colorado they perch in gulches. Eggs are laid singly on the underside of host plant leaves. 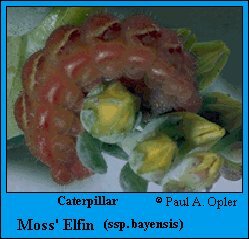 Young caterpillars feed on leaves; older ones on flowers and fruits. Chrysalids hibernate. Caterpillar hosts: Stonecrop (Sedum, Sedella, Dudleya, and Parvisedum) species in the Crassulaceae family. Habitat: Rocky outcrops, woody canyons, cliffs. Range: Patchy, isolated populations from British Columbia south to southern California, east to Wyoming and Colorado. Conservation: The San Bruno Elfin (Callophrys mossii bayensis) is listed as Endangered by the U. S. Fish & Wildlife Service. This subspecies is limited to the San Bruno Mountains in San Mateo County, California and a few nearby sites. The San Bruno Elfin has The Nature Conservancy Rank of T1 - Critically imperiled because of extreme rarity (5 or fewer occurrences, or very few remaining individuals), or because of some factor of its biology making it especially vulnerable to extinction. (Critically endangered throughout its range). Management needs: Protect habitat of the San Bruno Elfin and other limited populations from development and encroachment by non-native plants. species of North America, Vol. 2. Beacham Publishing, Inc., Washington, D. C.